Home of America’s Most Haunted Hotel, Eureka Springs scares up some freaky fall fun starting in September. Get Stuck on the Edge of Your Seat with Intrigue Theater. An illusionist and a medium explore mysterious phenomena in Eureka Springs Most Unique Venues! Get tickets online now! Friday Night, September 27th the Eureka Springs Zombie Invasion in association with Eureka Springs Downtown Network, and the Northwest Arkansas Hauntours invite you to a night of freaky family fun! As part of the ESDN’s 4th Friday “Fun After Five” series, Center Street will be closed to traffic and the Basin Spring Park in downtown Eureka Springs will be overrun with zombies!! Bring the whole family for a night of games, ghouls, costume contests, and creeps. Events start at 5PM and run through the special screening of the film The Last Man on Earth. WALKING DEAD LOOK-A-LIKE CONTEST – Dress as your favorite zombie killer (or zombie?) from the popular television horror series for your chance to win a special zombie prize pack that includes a NWA Hauntours haunted attraction pass! KIDS ACTIVITIES AND GAMES SPONSORED BY EUREKA SPRINGS HIGH SCHOOL FBLA – Kids will enjoy fishing for prizes in the “undead duck pond” and other ghastly games for mini-ghouls! NWA HAUNTOURS SCARE BOOTH – The Northwest Arkansas Hauntours, a group of regional Halloween-themed businesses and haunting professionals will be on site with creepy effects and information on this year’s exciting haunt offerings! ZOMBIE FACE PAINTING – Don’t be caught dead still looking alive! Get your mildly macabre makeover! BRETT HOUSER, ZOMBIE AUTHOR – Local Ozark writer Brett Houser will be signing copies of the first book in his excellent new “Creeper Rise” zombie fiction series! Mr. Houser has also agreed to do a short reading from his book. CRESCENT HOTEL GHOST TOURS – Spirit guides will be on site to assist you in your interactions with the dead at “America’s Most Haunted Hotel”! – Tour America’s Most Haunted Hotel anytime with tickets online! ZOMBIE DEFENSE TRAINING – Groves Karate Studio will be presenting free demonstrations on some of the best ways to defend yourself in case of a zombie attack! ZOMBIE APOCALYPSE SHOOTING RANGE – Test your targeting skills against the undead in the Zombie Apocalypse paintball shooting range on Center Street! ZOMBIE ART CONTEST – Calling all artists, young and old! 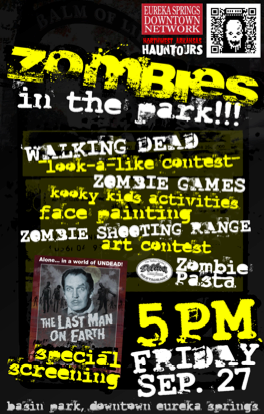 Bring your best zombie-themed masterpiece and an easel to display it, for a chance to win a special prize. ZOMBIE PASTA – DeVito’s Restaurant on Center Street will be offering zombie lovers a special Green Zombie Pasta Special, as well as two creepy new cocktails – the “Voodootini” and “Modern Zombie”! ZOMBIE VENDORS AND MACABRE MERCHANDISE – Deck your halls with things that crawl, as professional scare vendors present the latest in custom Halloween props, decor, jewelry, and more! UNDEAD DANCING – DJ Testube will provide a one-of-a-kind monster mashup as the soundtrack for the event. Feel free to shake your bones! CLASSIC ZOMBIE FILM SCREENING – The night will end with a screening of the classic zombie thriller “Last Man on Earth” starring Vincent Price! The Zombies in the Park event is the pre-event of the actual Zombie Crawl held on November 2nd in Downtown Eureka Springs. This event is part of the monthly Fun After 5! events hosted by Eureka Springs Downtown Network to foster a vibrant downtown. Events are the 4th Friday of each month March – November. Learn more about Eureka Springs Nightlife, Eureka Springs Lodging, Eureka Springs Restaurants, and Eureka Springs Attractions. This entry was posted on September 20, 2013 by estcblog in Attractions, Basin Park Hotel, Crescent Hotel, Festivals, Fun Downtown, Ghosts, Things to Do and tagged America's Most Haunted Hotel, Arkansas, BRETT HOUSER, Crescent Hotel, downtown, Eureka Springs, Eureka Springs Arkansas, Fayetteville–Springdale–Rogers Metropolitan Area, historic downtown, local culture, Most Haunted, Outdoor, Ozark.